Take your garden to heaven in just seven weeks! The Seventh Heaven has been given its name not just because the cannabis plants flower in seven weeks. This strain will produce very fine quality skunk that is worthy of its name guaranteed. The plants grow very vigorously and produce buds that are resistant to mould as the buds allow some airflow just watch that humidity as they can get very fat and with very fat bud you get a higher chance of natural spoors that can contaminate a crop. 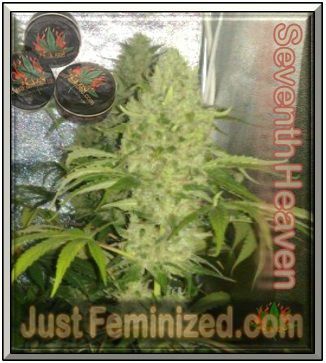 The Seventh Heaven female cannabis seeds will grow to a short or medium height and have a similar but slightly smaller stature like The Ultimate by Dutch Passion. The only problem we found with The Ultimate is that it flowers in 12 weeks and grows a little out of hand. This marijuana strain grows slightly smaller, a lot faster and produces a very worthy crop of high THC and really delicious smoke. We have these feminized cannabis seeds in short supply at the moment but our green fingered horticulturist friends are working on the next batch as we speak. Seventh Heaven will respond very well to being topped to give a nice even canopy and does especially well with a 9 plant per meter ratio or 1.2 meter is optimal. just to say that the delivery method was spot on and was despatched as was stated and received before 1pm the day after, i'm very pleased, so far the company has done exactly what it says on the tin, i love the despatch goods and the envelope and the goods came in an air tight smart tin, quite impressive!